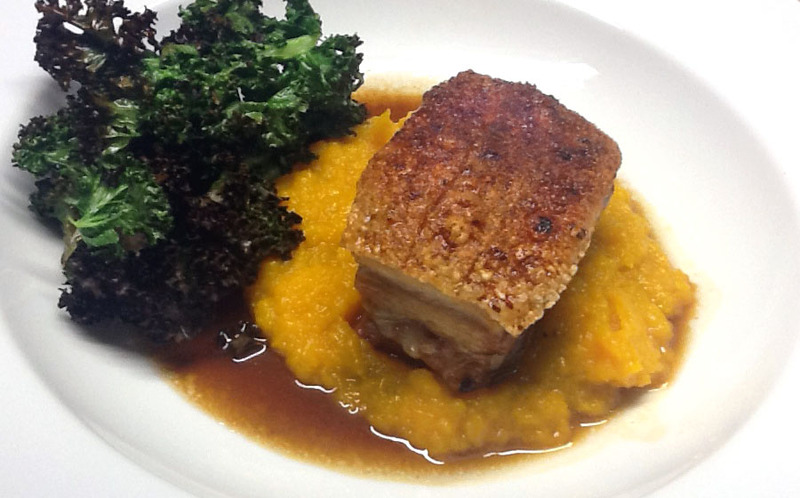 We had this recipe from Delicious magazine last night and it was just as yummy as it looks in the photo. I made half the salmon and pumpkin – enough to serve two people – but all the almond pesto. The left-over pesto will be nice served with pasta, grilled chicken or steak, or drizzled over home-made wintery soups. Preheat oven to 200°C and line a large roasting pan with baking paper. Cut pumpkin into 2-3cm cubes and place on the paper with the rosemary and 1 Tbs oil. Season and toss to combine. Roast for 15 mins or until almost tender. To make pesto place parsley, almonds and garlic in food processor and whiz to combine. Add the ½ cup olive oil, scrape into a small bowl and season to taste. I also added the juice of half a lime, to give it a bit more zing. 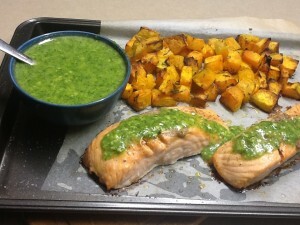 Brush salmon with remaining 1 Tbs oil, season and add to the roasting pan with the pumpkin. Bake for a further 10 mins or until just cooked. Divide salmon and pumpkin among 4 plates and serve with the pesto and a steamed green vegetable such as beans, snow peas, brussels sprouts or broccoli. Once or twice a fortnight we like to have a vegetarian dinner. 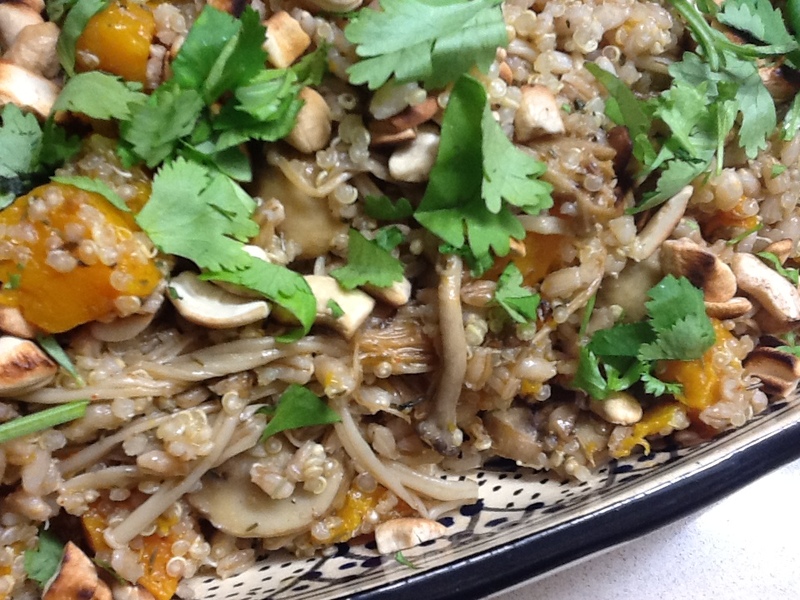 Matthew has always been a big fan of barley and I recently bought some quinoa, so I thought I would make a vegetarian dish combining these two grains. The result was delicious. Quinoa (pronounced kin-wah) originated in the Andean regions of Ecuador, Bolivia, Colombia and Peru, where it has been an important staple for 3-4000 years. It’s a grain-like crop, but not a member of the grass family, being more closely related to beets and spinach. The recent popularity of quinoa is due to the fact that it’s gluten-free and easy to digest. It’s also high in protein (14%), magnesium, iron and calcium. There has been some controversy of late over the high price the locals are having to pay for quinoa in South America, the price having gone through the roof due to increased exports. I know that some of my readers don’t eat meat, so this is one for you. Cook quinoa and barley separately in boiling salted water to cover. The barley will take about 40 mins and the quinoa about 10. Add more boiling water as necessary so they don’t boil dry. Don’t overcook – they should both be “al dente”. Rinse and thoroughly drain the grains and place in a bowl. While grains cook preheat oven to 180C. Mix pumpkin with remaining ingredients. Line an oven tray with baking paper and spread pumpkin mixture over it. Bake for 30 mins at 180 or until cooked and edges start darkening. Clean mushrooms if necessary, tear or cut up and mix with remaining ingredients. Line another oven tray with baking paper and spread mushroom mixture over it. Bake for 8-10 mins on the shelf under the pumpkin. 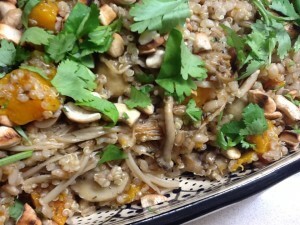 Add pumpkin and mushroom mixtures, including any oil and juices, to the cooked grains. Add vinegar, mix gently and check to see if it needs more salt and pepper. Tip into a serving dish or individual bowls. Serve lukewarm or cold, garnished with the toasted nuts and chopped herbs. Note: for the mushroom mix I used 150g of Shimeji, 100g of Enoki (both torn apart) and 250g of button mushrooms (wiped and thickly sliced) – all from Woolworths supermarket. If you can’t find fancy mushrooms use all button mushrooms. Variation: use brown rice instead of barley. I borrowed a cook book from the library last week called Five of the Best by Valli Little. It was printed to celebrate five years of the Australian food magazine Delicious. I read cookbooks the way some people read novels and by the time I had finished going through the recipes I had decided to buy a copy so I ordered one from the ABC bookshop. So far I’ve made several dishes including Tuna Stuffed Capsicum, Cauliflower Cheese Soup, Baked Eggplant with Goat Cheese and Cream and Thai Pumpkin Soup – all very good. We’re not vegetarians, but sometimes I think it makes a nice change to skip meat for a few days. 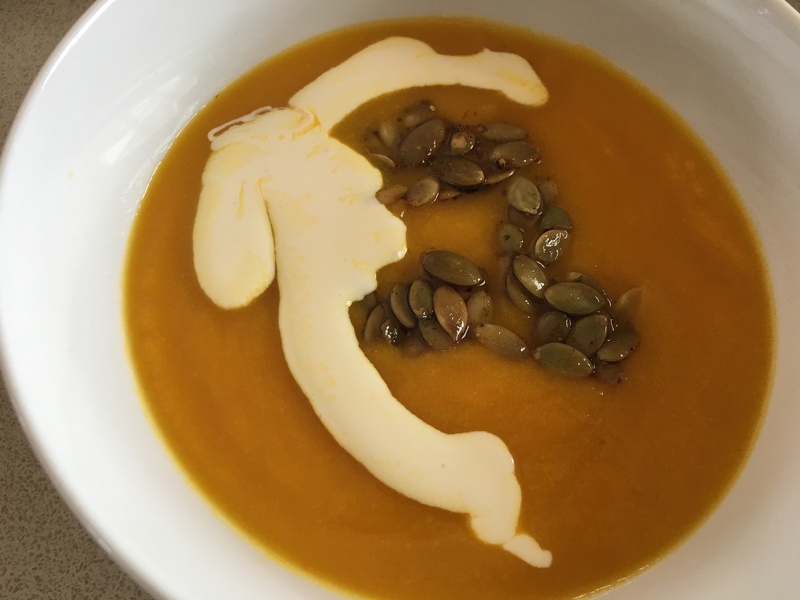 Here’s the Pumpkin Soup recipe. To make the pesto place coriander, lemon zest, lemon juice and garlic in food processor. Process adding 3 Tbs oil to make a sauce consistency, season to taste. Heat remaining tablespoon oil in a large pan over medium head. Add onion and stir for a minute. Add ginger and curry paste and stir for a minute. Add pumpkin and stock, bring to the boil, then simmer 15 minutes or until pumpkin is cooked. Cool a bit then blend until smooth. Return to the pan, add coconut milk and season, then warm through. 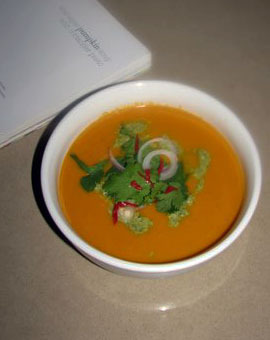 Ladle soup into bowls and garnish with a swirl of pesto, some onion, chilli and reserved coriander leaves. Note: to make a more substantial meal, serve with croutons or toast.